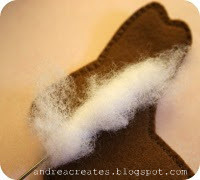 # 1: Fold a piece of felt at least 7x10 inches large, in half. I got mine here. 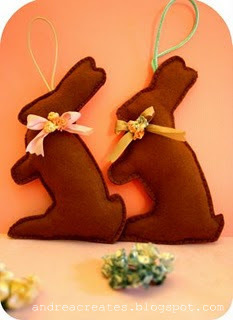 #3 Cut out bunnies. (You should have 2 if you folded your fabric in half). #4 Cut a cord, string or ribbon about 6 inches long. #5. 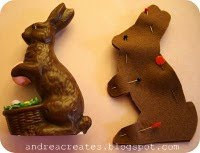 At this point you need to pin the cord, looped over with both raw ends tucked inside the bunny near where the bunny head and ears meet. (You will be stitching over this from the outside). Sorry, I don't have a picture of this step, but if you use your imagination and some of the finished photos you'll be able to see it. Remember, the cord is in between the front and back pieces here. (Except in my photos it isn't, lol). #7. Bring out your handy dandy stuffing fork (that you wish you had bought a long time ago)....and start inserting small pieces of your favorite type of fill. Start with the ears and work the filling into the face, paws, tail and feet. Then fill in the rest of the bunny, taking your time to smooth him out as you go so you don't get creases. 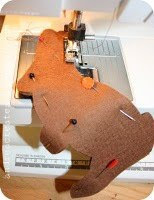 Leave a little stuffing free space near the opening so you don't sew over it in the next step. #8. Stitch opening shut, keeping stuffing inside and away from needle. #9. 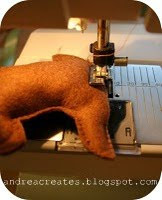 Trim off excess, being very very careful not to clip your stitches....Don't mind that the picture shows this step before I stuffed and stitched him shut. 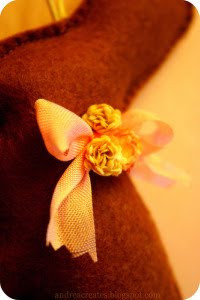 of ribbons and assorted trims, and choose one for your bunny. I used this one from here. And paper ribbons from there too. You're done! Admire your handy work. I think I might die of cuteness! Thanks for sharing such a thorough tutorial! Love the tutorial, such a cute little bunny! I have news for you! You won my little giveaway! I'm going to catch up with your blog now, so lovely! This is so cute for easter - and well explained! These are so cute,thank you for the tutorial. I tried this out and linked back to your lovely blog. The result is so cute. Thanks for your generous pattern! I don't mind you mentioning my attempt at all! Thanks again! I love your spring blog header too! Love this! So cute! Can't wait to make some bunnies for the babies in my Mother's Group. 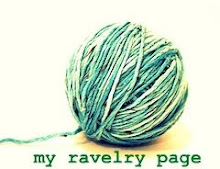 Will put pictures on my blog and link to you again when I make them! I can't wait to make one. Thank you so much for the time you took to create a tutorial. Cute bunnies! Lovely tutorial Andrea!